Today started with 5 helicopters dropping off 10 patients and 5 surgeries on the schedule. Dr. Goldberg and Dr. Crawford performed all 5 surgeries together which took about 12 hrs. These are not the types of "typical" surgeries these doctors do these days, and to do them with less than prime equipment and resources is more than challenging. Dr. Goldberg told his team before they left that on this trip they would have to "think outside the box" and they are!! One patient died today leaving behind a child who's mother was also killed in the quake. An all too common story. 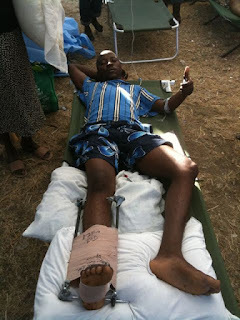 He had a tibia fracture and had been in the hospital when they arrived and developed a clot today and died. All of the team were hit hard by the reality of this. They have 16 patients currently in hospital and 12 need surgery. Tomorrow will be busy also. One of the patients on the schedule is a ballerina! Dr. Crawford may have to do many of the cases alone while Dr. Goldberg heads to do some negotiations with other facilities to get some patients moved to places that will better serve their needs, freeing up space to bring in more surgical patients. Dr. Goldberg says his team is "amazing and have worked like workhorses!!" They are exhausted and hoping to get tons of sleep tonight (last night only about 1hr). 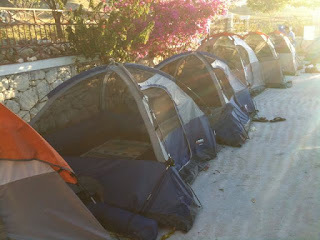 Picture #2: Team 2 "tent city"
The last of Team 1 left Mission of Hope at 7am to travel to the Domican Republic. Three helicopters brought patients to MOH during the day waiting on Team 2. Team 2 left Ft. Worth Spinks airport at 7am and after a 15 hour journey through Turks and Caicos for fuel to the DR. They then drove into Haiti, seeing 3 jackknifed trucks which caused a major traffic jam along the way. 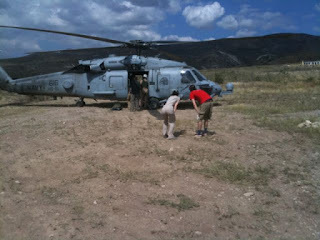 There was no cargo space on the planes to take any of the truckload of critically needed supplies. Those will be shipped to them this week. They overlapped briefly with Team 1 at the airport. Dr. Goldberg said they looked tired but healthy and that Dr. Hurt had obviously done a great job leading the team. Team 1 actually brought them a gift, a 12 pack of Presidente beer, for them to enjoy on the ride! While at the airport they assigned tasks to everyone. It is a huge blessing that they all get along very well. Dr. Goldberg said the difference between the DR and Haiti was unbelievable: poverty everywhere in Haiti, people living on top of each other in tent cities, people burning trash in the street. A night and day difference from DR. They arrived at MOH which is very nice on top of a hill where they got a good meal after not having anything to eat all day. They were amazed by the amount of infrastructure that Team 1 had put together, they went from nothing to a working OR and clinic. 2 ER physicians and a nurse from Maryland and 2 additional nurses from Canada staffed MOH during the overlap and will be a nice complement to our team. There were 12 patients waiting for them, 6 of them needing immediate surgery. They expect to receive an additional 10 to 31 patients transferred to MOH today. Team 2 is on the way to Haiti! A huge thanks to Dr. Robert Wills, Austin Pain Associates for guidance in developing this team! 7 patients were transferred from General Hospital. 6 wound vacs are on their way with Team 2, a very generous donation from KCI of San Antonio! These will be critical to the healing of the complex wounds we are treating at MOH. The Army is now flying patients to MOH on helicopters. Our team was really busy today! Multiple orthopedic cases. Ankles, forearms, distal femur fractures, a femur tib/fib fracture. Our team did one of the first ORIFs (open reduction internal fixation) in the country today, we are reportedly one of the only hospitals that can do these!! As Mission of Hope's Hospital #3 continues to gear up to receive more patients, the need for diagnostic & more surgical equipment is becoming urgent. An anesthesia machine is necessary to administer general anesthesia. More orthopedic fixation equipment is urgently needed, external fixators, plates, screws. Jeff Vichek, the brother of a Texas Orthopedics employee, worked with administration at Valley View Hospital in Glenwood Springs, Colorado to donate a mini c-arm. This is a huge donation, MOH will be the only hospital in Haiti to have a c-arm, something critical to orthopedic cases!! The c-arm will be shipped directly to MOH next week. "Texas Ortho group just showed off again last night...they did the 1st hand reconnection surgery since the earthquake on a 16 year old girl!" Way to go Dr. Loeb! 7 members of Team 1 landed in Austin Friday, 3 left mid-day with a Baylor group, flying from PAP to FL and catching commercial airlines home (Dr. Loeb was in this group) and the final 8 will fly home Saturday on the plane that is taking Team 2 to the Dominican Republic. As of the time of this post, they are at the airport! A van from Hill Country Bible Church will meed them in Ft. Worth to bring those that reside in Austin home. (Dr. Hurt, Dr. Gueramy, Dr. Curtis, Lindsey Griffin, Jenny Husband, Craig Laurents, and Tim Marvin from Austin will be in this group). DONATIONS CAN BE MADE TO WWW.HCBC.COM. The hospital at MOH is the first and only hospital in PAP capable of performing open reduction internal fixation procedures. Last night the team also performed the first hand reconstruction surgery on a 16 year old girl. The other hospitals will now transfer patients to MOH for these procedures... which means more patients for our team to help heal! They received a call from General Hospital today to transfer 7 patients. They will receive a paraplegic boy, several infected wounds, patients with fractures, and a woman that was trapped in rubble for so many days that she has decubitus ulcers. In our donations, we have decubitis beds and have a unique way of caring for this patient. Dr. Hurt emphasized the safety and cleanliness of Hospital #3 compared to some other facilities. They spent a lot of time yesterday and will do more so today preparing to staff an inpatient facility long-term, determining nursing ratios and night shift functions. They anticipate being able to accomodate a 14 day length of stay for their patients and have converted the school into an inpatient ward. They have several patients with wounds so deep that you can see bones. They have an urgent need for a wound vac to care for these patients, they will have a long road to recovery but he is confident that the sterile conditions at Hospital #3 will be able to successfully treat these patients. The had a flyover yesterday from the Army looking at the Mission and landing conditions, they are hopeful that MOH can be a resource for Army transport patients. As Mission of Hope's Hospital #3 continues to gear up to receive more patients, the need for diagnostic equipment is becoming urgent. Radiology equipment is lacking, there is a c-arm on the way. Laboratory equipment and supplies will continue to be a need, thanks to the generosity of a couple of facilities, we are sending a couple of microscopes and a few supplies with Team #2. Jennifer Kinman, with Texas Orthopedics was surprised when her 4 year old son went into a monologue about the need for help in Haiti. With his mommy working logistics for the medical teams 24/7, he's watched a little too much TV. See the video here! Dr. Robert Wills, Austin Pain Associates, who is providing guidance for medical team formation and will be traveling with a future team to Mission of Hope was touched by his 7 year old twins who solicited their friends to write letters to the Haitian children. Unfortunately, room is limited so we can't send more, but a few notes and pictures will definitely brighten the day of these children, many homeless and missing family members. 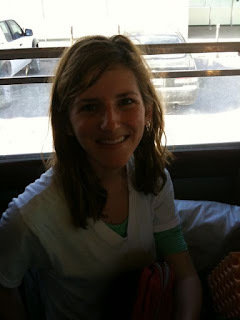 Quick update from Dr. Smith late last night: "back in the USA after five days in Haiti. They still need lots of help. Photos to come. Thanks for all the support. This changed my life. We are so so fortunate." 1240- The 31 pallets of supplies have arrived and are being loaded into trucks to be taken to MOH. Today our team members have been in town helping at the general clinic. They plan to go into town tomorrow to help at the main hospitals and clinics in town. 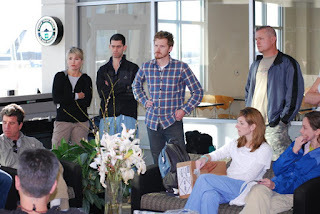 Team #2 has been mobilized and is scheduled to depart for a week trip to Haiti this Sat. It is a smaller team than the original (13). Please pray for them and their families as they clear schedules and make preparations. "HCBC family, hospitals, and others...thank you for all the medical equipment that ya'll sent down! It was an awesome site..God used ya!" 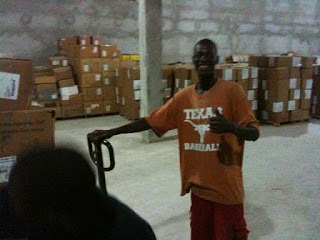 Pic 1: God answers another prayer and uses a dude with a Texas t-shirt! The food and medical supplies from the Austin church and medical community arrived tonight! 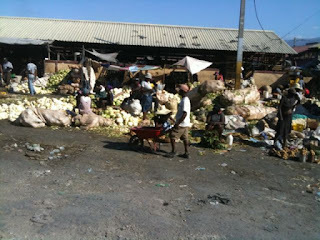 Pic 2: This is their industry of food trying to re-start...unfortunately, the smell is pretty rough. Pic 3: One of the saddest images is this mass burial site about 3 miles from Mission of Hope...80,000 bodies. 24 hours a day operation. Pic 4: Dr. Scott Smith following up on one of his patients with a dual pelvic fracture and dislocation over SI joint. Pic 5: Here's her xray...she's 1 tough girl. She has been dealing with this for 2 weeks untreated--wow! 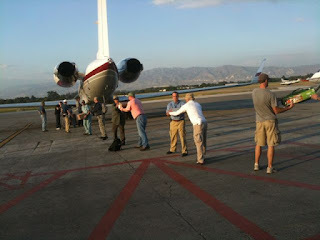 *** Seven team members flying out of Haiti today, arriving in Austin tomorrow morning! *Today our team members have been in town helping at the general clinic. *They saw over 100 patients in the clinic at MOH today; mostly general medical issues, several forearm fractures, distal radius fractures in kids. They are having some amputees coming back for evaluation. *Goal to get patients where they need to be and the long term care that they will need to have. 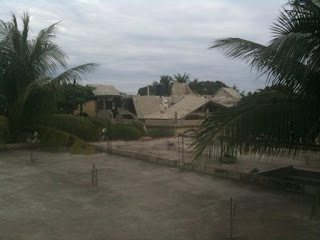 Picture #1: Picture of what is left of a building. 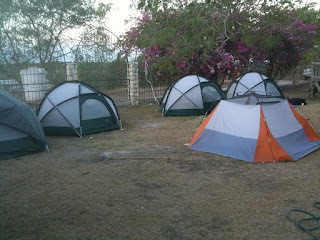 Picture #2: The tent city home for our team members on the MOH property. Last night the team did a revision humeral amputation on an 8 year old girl's arm. When she woke up in the ward she asked the nurses about Jesus and prayed to be saved. The orphans in the orphanage there started singing Hosanna in creole. Dr. Hurt said it was pretty amazing to see. WE GOT A C-ARM to take xrays!! Such a valuable piece of equipment. Another team came through and said our OR is the cleanest OR they've seen. Small teams of 3-4 people went out and made rounds in the small out lying villages today. They basically went tent to tent to see if anyone needed medical attention. The 31 pallets of supplies will arrive tomorrow. 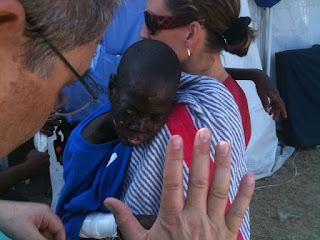 A little boy (pictured above) was dropped off at the gate today and has meningitis. He was taken to the USS to get eye surgery he desperately needed! He was also diagnosed with a 1 in more then a million disease...xerdeapigmentosa. It's a tropical disease. The had a MVC (motor vehicle collision) patient today that had an open tib/fib fracture they took to the OR washed out and placed an ex fix on. They also washed out axillary pus on the patient. Washed out a couple of ward patients. They have some sick medicine patients...trying to treat or transfer. One of the pastors with the group was leaving the compound and witnessed a kid on a bike get hit by a car. They loaded him up and brought him to our team. The ran a code trauma on the kid, c-spine, took him to the OR to wash out his injuries. He had a proximal closed tib/fib fracture. Xray would be a great benefit to treating these patients. Hopefully the c-arm will arrive soon! Dr. Matt Bush, ER doctor, sees about 60 patients a day at the clinic. That's a good amount of patients for an ER clinic. Nice work Dr. Bush! To work with MOH to set up a prosthesis clinic in the coming months. Thousands have lost limbs here in Haiti and manual work is a huge lifestyle. The population would greatly benefit from this type of mission. PT and prosteticians would run the clinic along with trained doctors. Picture: Dr. Will Curtis (Austin Anesthesiology Group) and the little boy that was dropped off at their gate Monday. He will be going to the orphanage after being treated. 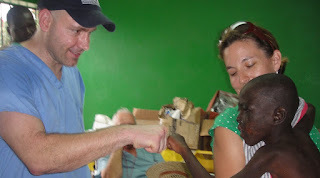 Picture #1: Dr. Tom Schott at the pediatric ward negotiating with a young boy. Picture #2: Pediatric ward. Surgeries are happening right next to where these young children lay. Picture #3: This medical student had a wall fall on him. He is one of just half a class that survivied. He told our team "he will be the best ortho doctor after he heals!" He is on his way to the USS Comfort, bible in hand. Picture #4: This little boy was taken to USS Comfort for eye surgery. 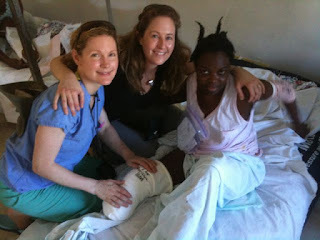 Picture #5: Amputee with team members from Austin that helped save her life! Dr. Hurt just called with an update. The Army will be evaluating landing conditions at the Mission of Hope today to bring more orthopedic cases in. Our team has helped the MOH setup a 50 bed inpatient facility in one of the schools on campus. Right now they have had about 15 inpatients at a time. Dr. Hurt is very proud of the supplies that they have and mentioned our team has been able to help other hospitals in town with supplies. The team is refining processes and creating a more sterile environment in the OR, which was formerly a laboratory. They have done 4 surgeries already today! The following was provided by Ashley Hurt. Today wasn't that busy so the team did a lot of organizing , discharges, and recruitment for new patients. Joel went back into town to the general hospital to recruit. He met a guy that said he could helicopter 12 patients a day to them. They'll have to see if this pans out. Will know by 0800 or 0830 tomorrow. At the general hospital medical personnel write Dr. and their first name along with specialty on a piece of tape and wear it on your chest for identification. Different to go by Dr Joel he said. Presbyterian hospital was supposed to send 10 patients to them today. The team didn't receive them and no one could explain why these patients weren't sent. Everything is very confusing over there. If pt volume doesn't pick up all team members will come home on Thursday or Friday. We will know more tomorrow. They had 50 or so beds donated to them today. So now they could really ramp up surgical volume since they have a way to house the post ops. Would need to secure and verify next teams coming to make sure someone is on the ground at all times to care for these patients. "One thing you can count on is you can't count on anything" There's a lot of confusion and plans are always changing per Joel. Joel wants me to reiterate how safe it is there. It is a very secure location. They had an emergent C-section they sent to the ER. She became eclamptic and seized. Mother and baby did well. 1 death today. They operated on her yesterday. She had a traumatic AKA (above the knee amputation) right after the quake. They revised and closed the leg. She became very ill so they transferred her to the hospital. She was very anemic. In route she coded and died. 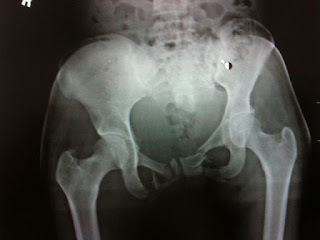 Dr Loeb put a hip spica (difficult cast) on an 8 yr old today. Joel was impressed with the final product. Nice work Dr Loeb! A driver for one of the teams is a survivor from the earthquake. He was on the ground floor of a building with 50 or 60 other people in his class when the quake hit. He was crushed under rubble, pinned down. He heard people screaming and dying slowly. He was able to reach his friends hand and hold her hand until she died. He could only breath shallow breaths under all the rubble. Another friend dug him out from the second story. His teacher took him back to the building along with the 12 other survivors who had gashes, wounds, amputations. He was the only one walking with barely a scratch. He said, "why me?" Sounds like today was slightly less crazy than yesterday - they operated late into the night last night, and then post-op kept them quite busy overnight. Tim says they have one of the cleanest and most functional OR's in Haiti at the moment - so kudos to all who have put it into action! They are most in need of x-ray at the moment. I'm told they do need a microscope and supplies, like slides and field stain to go with it; any lab supplies that they can get their hands on would be welcome - yes to UA's, CBC's and any type of chemistry eval. They hope to turn the mission's clinic into a fully-functional hospital.. sounds like they're well on their way! Tim says the Navy may be flying some patients to them tomorrow (if they can find a place to land!) as they have good OR's and ability to sterilize (unlike other OR's). Although the autoclave works well, they need a bigger one, or greater capacity for cleaning instruments. Tim says right now they have a surplus of surgical instruments, and really don't need any more sent at this time. As far as anesthesia- they are doing well with spinals for the time being. They had a patient seize during childbirth last night (eclampsia), and they were able to send her to the main hospital for an emergency c-section; mother and baby did well - so that's good news! I'm told they are not requesting any additional OB/gyn supplies at this time. 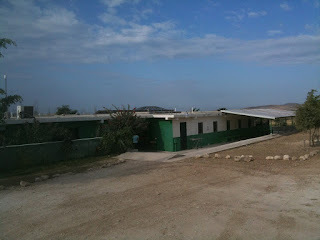 Today we learned that there are 6 "hospitals" setup in the Port-au-Prince area. The Mission of Hope hospital is "Hospital #3" and Hill Country Bible Church will lead the medical team efforts for at least a 3 month course. Many medical teams are landing in the city with no direct plan or facility to work with. The Mission of Hope has become a landing ground for many of these teams making our current need for medical volunteers not as urgent. Tomorrow a meeting will be held to chart out future needs for the facility. If you are interested in volunteering, please register with Hill Country Bible Church on their website: www.hcbc.com, under Haiti Earthquake Relief. We also learned that the Mission of Hope is distributing 500,000 meals per day. This is 2-3 times the amount that the United Nations is delivering. Because the MOH is staffed with about 160 Haitians (with only 7 Americans staffers), with supply channel relationships, they are able to receive and deliver food much easier than other organizations. This is phenomenal! Hill Country Bible Church also received confirmation that the 22 tons of medical supplies that the Central Texas community collected are on their way to Haiti. They should arrive Thursday! Words cannot adequately express our gratitude to the medical community, church community and private individuals for your speedy generosity! Again, right now, we do not need any other medical supplies beyond the list from the last post. We learned that our medical team saved the life of a mother and her baby today! We cannot wait to hear more about their day. We are no longer are in need of general medical supplies. We ARE in need of specific medical equipment. If you would like to give a tax deductible monetary donation towards medical equipment or sign up to volunteer please visit the Hill Country Bible Church website, www.hcbc.com. The following was compiled by Dr. Hurt's wife, Ashley. 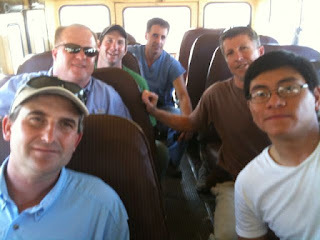 This am: Dr. Joel Hurt went with another medical group today to downtown Haitian hospital. Saw lots of pts in tents lots of amputations. 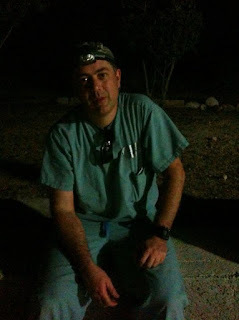 1330: text From Dr. Scott Smith: "we have done 8 major cases and several minor ones. Haitians are TOUGH. They are very stoic and grateful. We have tons of work to do here. Great crew and nice facilities"
Mid-afternoon: text from Dr. Tim Guermay: "Several surgeries completed today; team driving in Port-au-Prince and finding more patients that need care." 1936: text from Dr. Hurt "it's crazy right now." 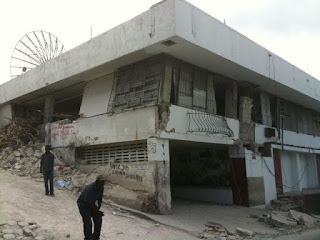 This am he went to downtown Haiti to the main hospital there, think Parkland in Dallas. The mission had done little advertising for the team since the details of the arriving and what supplies we had available was uncertain. He wanted to make sure we could get patients. 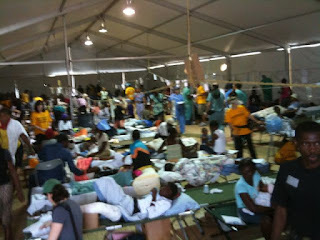 At the downtown hospital there were tents set up everywhere as wards and patient holding areas. For example the Swiss have a tent set up as an pediatric operating suite. There are multiple international teams there. While Dr. Hurt was there a general surgeon grabbed him and ask Dr. Hurt to help her round in these tents. He said the charts are difficult to read some entries are in different languages, hard to know the last time someone saw the patients, etc. When he would come upon a patient that need to go back to the OR he'd tell a PA that was following them, they would take a sheet of paper with the tent # and bed # to the OR and a few minutes later another crew would be there and take the patient. Dr. Hurt rounded for 3-4 hours. 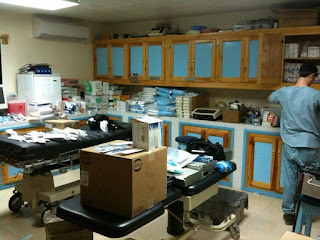 The OR's at the Haitian hospital are like open out houses. Enclosed spaces with slits in the top of the walls to the outside. Our team converted a room into a 2 bed OR with AC and an autoclave, way to sterilize our equipment. The main hospital downtown in Haiti doesn't have an autoclave. So far we are the only we know that have this tool. There are 30-40 other medical people at the mission along with our team. Many are medics that go out in the day to surrounding villages. Communication stinks there. All the towers have been damaged. After rounding Dr. Hurt tried to get some xray equipment. After a 4 hour round about tour of Haiti he arrived at the MOH unsuccesful. A mini-c arm is needed! Our team performed around 14 surgeries today with 16-17 in house patients remaining. The RNs and doctors will be taking turns over night to stay with these patients and take care of them. Dr. Hurt has the next 3 hours and is currently relieving Dr Gueramy. 1 death- at 2130 an ambulance pulled up with a man hit by a car. He was pronounced once they got him into the clinic area. A boy was left at the front gate today. He has learning disabilities. He'll be taken to the orphanage tomorrow. My heart breaks. Dr. Smith shared with Dr. Hurt something he'll never forget. Our OR is a two bed OR. Today 2 women were getting their amputations revised, which involves cutting more of the leg off. They had spinals and were in no pain. Both of the women started singing a haitain hymn while the saw blades were going. I would never be able to forget that moment either. People are desperate to keep their legs, preventing some of them from seeking the medical care they need. You lose your leg you lose your life. Our team has the equipment to save limbs...thank the Lord! Hopefully they're able to save a lot. 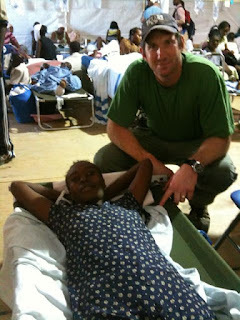 Side note: I saw on FOX news a request from a physical therapist in Haiti to send more PT's there. If you are a therapist or know one that would be interested in going (must have current passport and experience). 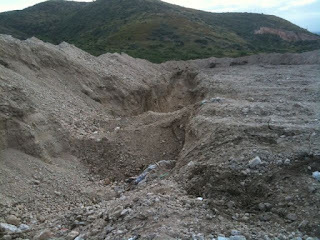 We now have a clear free way out of Haiti for our teams. From PAP to FL. Praise God! Arrival times to Austin will depend on the domestic departures from FL. We likely won't know the timing of the flights out of Haiti till the day before. So if you have a loved one scheduled to come home on Thursday, we should know some info about their flights on Wed. Coming home Sat, we'll know something on Friday. As soon as I hear something I'll be sure to send that out. -We could really use an anesthesia machine...would 1 of the hospitals donate 1? It would be a HUGE help. Structural Engineer (We don’t know the structural integrity of the buildings yet...orphans are still sleeping in tents). General Contractor and a fence team of 4 workers. (It would be good if the contractor had site survey experience). This team should plan to stay for 2 weeks. Skid Steer operator (This would be HUGE...we really need to raise the finances for the actual skid steer est..$50K. We could use this person immediately after acquisition of the skid steer). Diesel Automotive Mechanic (Someone who could figure out what needs to be done on all the equipment, order it, and then do the work). 1 Warehouse operator (They need to know how to set up a rack system within a warehouse....they will be setting up the existing and new storage areas and training the nationals on how to run it). We need a 125 Kw generator ($35K)...we have 1 running currently but we don’t have a backup at all. We should really be running 2 at staggered integrals...the mission and hospital goes dark if it goes down. There is a big security issue with this as well...if we go dark...we’ll have troubles with people jumping the fence and taking the food. 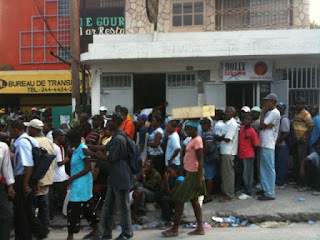 If you would like to donate to help the Haiti cause please go to www.hcbc.com or email Jonathon Patton jpatton1214@gmail.com. Money will go to purchases listed above, flights to and from Haiti, or any other need that presents itself. Help Haiti T-shirts! www.helphaitishirt.com 100% of the proceeds go to missions working out of Haiti. They're awesome. Pic 1: Teams unloading the planes yesterday, they had 10 minutes to unload! 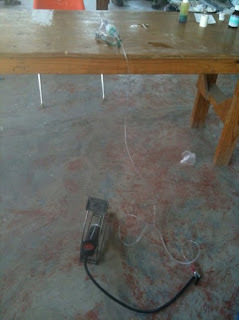 Pic 3: Running a nebulizer off a bicycle foot pump. 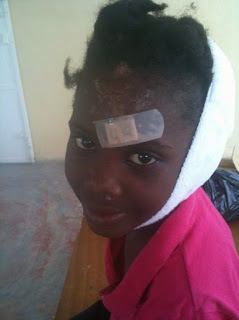 Pic 4: Little girl with infected, depressed skull fracture. Still smiling-Amazing! Less than 24 hours on the ground, the medical team has already converted a destroyed lab into an operating room and are performing surgeries. Here is Dr. Loeb fixing a compound tib/fib fracture that happened 13 days ago! A text from Dr. Smith at 1:30 said: "we have done 8 major cases and several minor ones. Haitians are TOUGH. They are very stoic and grateful. We have tons of work to do here. 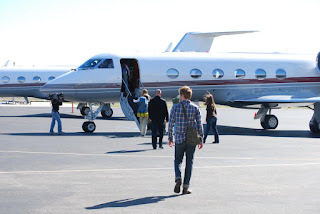 Great crew and nice facilities"
The planes arrived Sunday afternoon. The team had dinner together and then began unloading medical supplies at the Hope for Haiti mission home; the team will be working there as well as sleeping there. Medics at the mission will travel daily to the outlying villages and bring patients back for treatment. Through the generosity of a Hill Country Bible Church member, two jets were donated to fly the 3.5 hour flight to Haiti on Sunday. The jets were loaded with 26,000 lbs of supplies and 18 medical providers. “Occasionally in life there are those moments of unutterable fulfillment which cannot be completely explained by those symbols called words. Their meanings can only be articulated by the inaudible language of the heart.” Martin Luther King, Jr.
From the first moment I received the email just after midnight Thursday morning that planes had been secured and we needed to mobilize equipment and supplies to the Mission of Hope just north of Port-au-Prince, our staff and doctors have been working at break-neck speed. 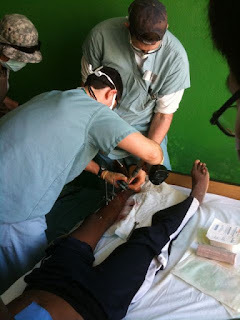 Many of you have been privy to the details of the operation through the media, but I wanted to share more information about Texas Orthopedics’ involvement and the immense opportunity that our physicians have to repair the lives that were spared in the massive earthquake that occurred in Haiti on January 12, 2010. I would be remiss if I didn’t mention that while I talk about Hill Country Bible Church throughout this narrative, I cannot even do them justice. They are an incredible group of people to be able to organize everything from fundraising, to transport, to shipping, to communication and I am proud they allowed us to help in this mission. They made this mission possible. Last week started with plans to send Dr. Hurt and two suitcases of precious supplies to Haiti with Mercy Works. One phone call from Dr. Smith’s neighbor, a member at Hill Country Bible Church (HCBC), changed all of that. Their church had been contacted by Mission of Hope Haiti earlier in the week to help with phone bank donations after they were featured on NBC Nightly News. One of the members of the church donated the use of two planes and soon a medical mission was underway. Dr. Smith and Dr. Hurt joined church members and other local doctors on a conference call Wednesday night with the MOH medical team to determine the biggest needs and develop a plan of action. Thursday morning, Dr. Hurt was interviewed by Bob Cole and Bucky Godbolt on KVET for over 10 minutes about the mission. Dr. Hurt and Alicia worked on a priority list of equipment and supplies. We sent out emails to our administrator peers, the Travis County Medical Society and contacted all of the hospitals to initiate a grassroots effort to secure the necessary items. Leslie and I also initiated a series of press releases to update the media. Tom and Yvonne prepared to receive and direct financial donations to HCBC as well as make opportunities available for our staff to donate. Dr. Hurt, Dr. Smith and Dr. Loeb strategized the appropriate personnel to take with only 18 spaces, given the fact that what started out with 7-9 grew quickly to 30 volunteers (doctors, nurses and other medical personnel that wanted to help). Dr. Hurt struggled with the decision . We put in calls to People’s Pharmacy who take great care in providing our medications for the surgery center to let them know we desperately needed antibiotics and analgesics. Dr. Mukai and Carolyn went to Costco to buy some supplies and speak with the pharmacy about potential donations. Then Jennifer L. and Dr. Mukai drove to Cedar Park Regional Medical Center where they were astounded by the hospital’s generosity. 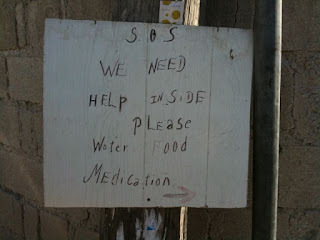 The doors to central supply were opened and Dr. Mukai was told to take anything that would be needed, any amount. We had to make multiple trips to the hospital to gather truckloads of everything and take it to the church. By Thursday afternoon, we had amassed a large amount of supplies in the space formerly occupied by charts in medical records. We had several staff members start sorting through everything during the day, Allen and Jennifer L. were instrumental. That night, Alicia led a team of volunteers including Stephanie, Cody, Kelley, Sharon Javier, his fiancé, Twyla, Danny, Erin, her mother, Erica, and Tanner to continue sorting the items that we had received thus far, prepare for items that we would receive on Friday and make a “critical needs” list. Dr. Mukai attended a TCMS scheduled event Thursday night where a spontaneous auction and fundraiser was held to support the fuel costs. She was in contact with me while she was there and I was able to provide to her the names of the medical team that would be traveling with our doctors for them to announce to the attendees. Friday morning was chaos, making contacts to hospitals for the urgent needs, sending staff all over town to collect from medical offices and our own offices that were listed with TCMS as drop stations. Huge donations came in from Seton, Seton Northwest, Brackenridge, Northwest Surgical Center, North Austin, North Austin Surgical Center, Austin Surgical Hospital, Texas Oncology, I can’t even name them all here. We had until 1:00 to finish sorting everything before a member of Twyla’s church who generously donated his time, truck and mover arrived to help us transport all of the items to the church. Naomi, Stephanie, Tanner and Karl completed the packing at Quarry Lake. With my Dad by my side, I accompanied our moving truck to HCBC. What we found there more doubled the amount of supplies that we had in our truck. Austin Radiological, Austin Samaritan and Seton had delivered large volumes of supplies directly there. In addition, other church groups, clinics and individuals brought supplies. HCBC Senior leadership, a couple of OR nurse volunteers and many more volunteers had been sorting supplies all morning. The nurses left and scary enough, myself and Dr. Tracy Haas (Dr. Tim Gueramy’s wife) were the only medically-inclined people. I was told to “stay in this room” and direct the sorting since I would know what everything was (ha! ), what a challenge for someone who is accustomed to being in a hundred places at once! I was soon joined by Leslie, Naomi, Allen, Tanner and Karl. Dr. Hurt and his wife, Ashley, Tim Marvin, Dr. Gueramy, Dr. Haas and Dr. Heinze, with the administrative help of Leslie, prioritized what would go on the planes. The church had taped on the floor the size of the cargo bins with the height available. Leslie and I left the church around 7:30pm Friday night. I had a nagging sense that we just didn’t get everything that was critical and was relieved when Dr. Hurt called me after watching them load the boxes on the airplanes. We still had room! Dr. Hurt and Alicia made a list for us to find the next morning. Robert Knox, his friend Sean, Leslie and I met at the church at 6:30am Saturday morning. We started pulling the items from the critical list and were joined by Dr. Hurt, Dr. Smith, Dr. Gueramy, Dr. Haas, Tim, Craig at 8:00. The doctors packed and repacked until they got exactly what they wanted for those nooks and crannies. I ran to TOSC to meet Robert and Mrs. White to catch a few last urgent supplies. The doctors from Dallas arrived, with some narcotics! The doctors went to the airport for their 11:00 take-off, only to be delayed by issues with clearance for landing in Haiti, they were grounded. While I know they were all very disappointed, I truly believe that was a gift for them to organize themselves, strategize, get to know one another and try to get some much needed rest. Also, it gave time for Dr. Robert Wills, who will be leading the second team to MOH, time to secure more narcotics for the trip. Meanwhile, back at the church, Javier, his fiancé Anna, Cody, Melissa, Erica and Elena directed the HCBC volunteers in sorting through the remaining supplies to be packed. HCBC had secured a cargo truck to ship everything to Miami, then meet up with Hope for Haiti and Heart to Heart transport planes who will transport it to MOH for a Thursday arrival. I am thrilled that we were able to send every single item that was donated to our offices by noon Friday to MOH Haiti, despite it not being able to go on the plane with our doctors. Today, my son Peyton and I had the distinct honor to join Ashley Hurt, AnnaBeth Loeb, Dr.Tracy Haas, church members and other family and friends for the big send-off. Take-off went as planned and let me tell you, what a sight to see those planes lift off! If I haven’t mentioned your name in here, my deepest apologies, because it is the rest of you who carried the torch and tended to our first priority, our patients. I know that your thoughts were with us and have the utmost confidence that given the opportunity and the time for adequate planning, every single one of our staff members would have jumped in to help. As if I haven’t been inspired enough by the remarkable physicians in our group over my 17 years tenure with Texas Orthopedics, I have been blessed to be a part of this experience. 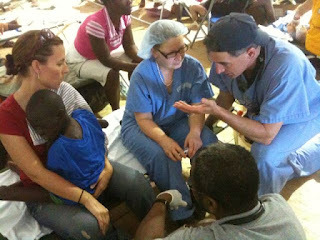 My heart and mind will be with our doctors as long as they are in Haiti. I pray for their safety, their surgical skills, their leadership, their mental stability, their physical strength and lastly that we were able to ship the most urgent supplies that they need for the daunting task ahead of them. This is TEAMWORK, This is Texas Orthopedics.